Changing the look and format of your widgets such as fonts, position, rotation, adding html/css, etc. To format a widget, select the widget and under the Format tab, you'll find two tabs for Style & Settings. 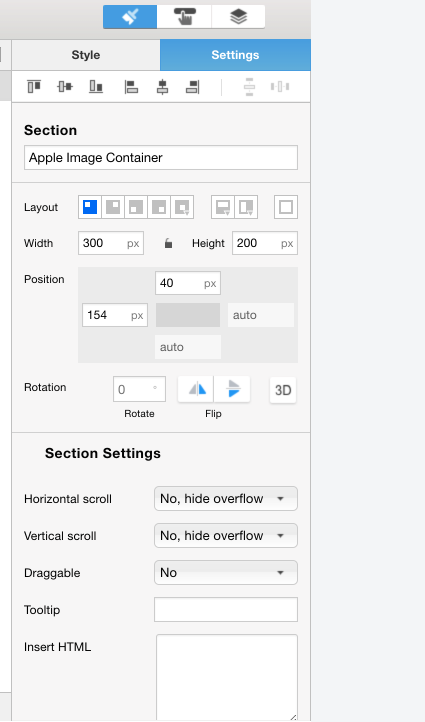 Under the Style tab, you'll find a selection of controls to change size, fonts, position, fill color, etc. as well as applying CSS styles. In the Settings tab, there are additional control over the way the widget looks and works. Here's where you can also apply HTML (Section widget only). When you set formatting, you are overriding the baseline formatting (which is determined by the Style and/or widget’s parent container). To return the widget to its baseline format, click on the 'Clear Formatting' button at the bottom of the formatting panel. Note: Saved Styles cannot be edited or applied in Editor, but the formatting effects of the Saved Style are applied to the widgets in editor.